The famous entertainmanet auction house Heritage announced a new auction with 47 Elvis related items. 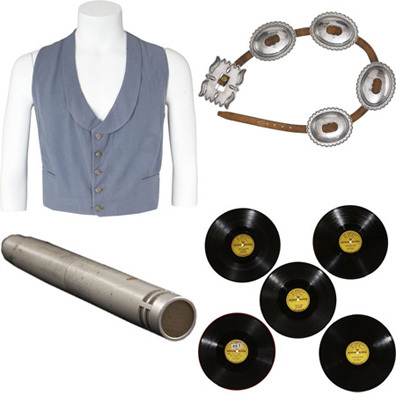 Among the pieces are rare vinyl records and signed pictures, but also items that belonged to Elvis like a vest he used in the movie 'Flaming Star', the 'Silver Concho Belt' and a stage microphone. There are items from the JD Sumner estate too. The auction ends on February 22. I'll have the Sun 78s, thank you, but you can keep the other stuff. I was hoping this auction would include some of Elvis' hair so that I could have it DNA sampled and then sewn into the scalps of all the young people in the world so that they'd get to like Elvis and buy his records and get him back in the charts again. Because we must get Elvis in the charts again because it's important for the history of mankind. The young generation must get to like Elvis or else the world will end. Not to mention the 20% buyers fee they add to the winning bid. Ridiculous. the items can't be more expensive than Tunzi's books.. I checked this out last night & the items are ridicuously expensive. Good luck on this auction!